“The Ables” is a story about disabled super-powered kids who are “invisible” or “less than” in society’s eyes, due to their disabilities. The main characters of the novel are led by Phillip, a blind teenager with telekinetic abilities who refuses to let anyone tell him what he can or cannot do. Faced with a threat powerful enough to tear apart their families, town and the world beyond, the kids form a team of superheroes and together help each other to overcome their disabilities and protect the ones they love. 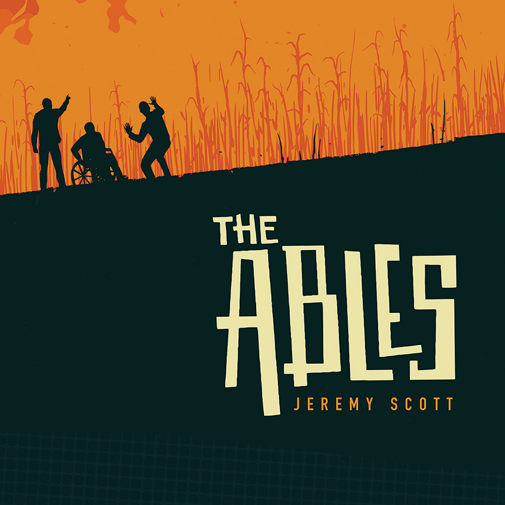 Days after “The Ables” hit the shelves, Jeremy took time to talk to TAM about the book, its creation, and the business of self publishing. When did you first come up with the idea for “The Ables”? It was probably about 10 years ago. I was bored and sketching on a piece of paper, and the idea I started with was actually about senior citizens who were judges, attorneys, former cops and other people connected to the criminal justice system. They were a part of a vigilante super-hero squad after hours, but they were all disabled. So, I drew these character names, descriptions and doodles and then set it aside. After that, it just kind of stayed in my brain and I kept coming back to it and attacking it from different angles. I think what mostly drove me was the idea of a super-powered individual in a world of superheroes, but who was stuck between the heroes and regular humans due to some sort of hindrance of their abilities, or physical disability, as it ended up in the book. Eventually, I changed the characters to children and the book began to formulate, but it was just an idea that never left. A lot of my ideas come and go, but this one just planted itself. When did you actually decide to sit down and turn the idea into a book? My partner on the Cinema Sins YouTube channel, Chris, and I had been friends for about fifteen years. We both had ideas for stories, so we decided to keep each other honest and write at the same time and share chapters every week. “The Ables” was actually the book that came out of our second exercise doing that. We had each written another novel and while my first one was terrible, I think I needed to get it out of the way. “The Ables” had started off as a comic book in my mind. Once I accepted that I can’t draw and don’t know anybody in that world, but I can write, that’s when it became a novel in my mind and I started typing. How many hours do you think you actually put into writing it? Oh my goodness… a lot. Hundreds and hundreds if not more. I wrote for a couple of hours a night for seven or eight months on the first draft and then over the last eight years there have been close to 20 rewrites. Some of those were more intensive than others. I don’t even begin to know how many hours, but I bet it is easily mind-blowing. Was there ever a time in the story’s development that you began to have an issue with the narrative being through the perspective of a blind person? The challenge of that was sort of why I did it. When I first thought of the idea, I originally wrote in third person perspective for about a third of the book. Something was missing though, so I went back and started over in the first person, which is a little more natural for me to write in anyway. I thought that while I am sure I’m not only author to ever write in the first person perspective of a blind person, the idea is definitely unique. I thought it would be interesting to try the to tell the story using either visuals from other people or Phillip’s other senses. It was tough. There were definitely times where I couldn’t do what I wanted to in terms of my original plan, but I think the book is better for it. For sure. I’m not trying to count any chickens before they hatch, so I’m not actively writing anything yet, but I’ve got an outline of four stories that I want to tell. So, if everything goes well, there will be future stories in this world and with these characters. Can you talk a little bit about working with CloverCroft publishing and the “custom publishing” model that they use? We’ve had nothing but a good experience with the CloverCroft people. They’re local to Nashville, like we are, and somebody that works with us had an existing relationship with them. That’s how we started working with them. Make no mistake about it… we’re cheating. We’re self published, but we’re starting with the Cinema Sins audience on YouTube to market the book to, which gives us an advantage. Our model was always to parlay our audience from YouTube and market the book to them, so we don’t need the system that’s already there for the publishing world. CloverCroft’s setup was perfect for that. What kind of benefits did CloverCroft bring to the table for you? As I understand it, if I had gone to one of the big publishers, pitched it and had it accepted, a lot of the decisions would then have been out of my hands. It wasn’t really about finances so much as it was about what the cover was going to look like, what the formatting was going to look like and how the marketing campaign was going to run. When you are published through one of the big publishing houses, you lose some control of that stuff, and that was pretty important to me. My audience on YouTube, I feel, needs to be treated with a certain kind of respect in the way you market to them. For me, that was the big thing, but then I remember a session where I sat down and picked everything I wanted. What kind of font, what kind of cover stock, what kind of paper… that was a really exciting day. I’m not sure if you were to go through the traditional publishing route that you would get to have all of those meetings. I’m not sure, but I don’t think you do. Given the amount of time you put into Cinema Sins every week, how do you approach time management for yourself? I struggle a lot with focus. I’ll put a kitchen timer on the desk when I’m really trying to get something done. I’ll set it to thirty minutes, work until it beeps, leave the room to do something else and then come back to it. I have to segment what I do, but it’s not scheduled so much. The luxury of being my own boss and working from home is that since I get a lot more done late at night than most people, I can stay up late and get the work done and not have to punch in at nine o’clock the next morning. I can sleep in if I want. The videos on the Cinema Sins channel will always be 90% of what our time goes to any given week, until we get to a point where we can hire and train writers who think like we do to start taking some of the load off. I won’t be able to write a sequel to the book until we get to that point. It’s just too much time being spent on making the videos. As a self publisher in print and online, what do you think your biggest challenge that faces you is? How have you overcome it? Chris and I both worked for an online marketing news and information website called ReelSEO. For a couple of years I was an editor on the site, writing articles about how to grow a YouTube channel, about the YouTube Creator Playbook, search engine optimization for video and other subjects. Other than all of that, which seeped into our brains while we worked there, most of which we followed when we started our own channel, we were just very lucky. Our first video got posted to Buzzfeed by someone other than us and that brought us a wave of coverage. After that it was just promotional hustle. Everyone that wrote about us that first week, we reached out to and told them we were making another video the next week. We were able bounce that coverage for four to five weeks with pretty big publications. Obviously, exposure is huge and I feel like a jerk telling someone that, because we kind of got lucky. So, what’s next the idea for you? We have other ideas, other plans for growth. We’re talking to other YouTube channels about entirely new endeavors that we would create together and co-own. We’re developing a series for Chris where he is going to travel around and do some movie trivia stuff that I am pretty excited about. We have plenty of people working for us now and managing the side channels we’ve started. For me, creatively, the next book is where my heart is. I can’t wait to get it going, whether it’s a sequel to “The Ables” or another story, I just loved the experience of doing it so much that I want to do it again. “The Ables” is available now, in paperback, audiobook and for The Amazon Kindle. Order a copy here. I'm a lifetime geek, writer, proud husband and father.